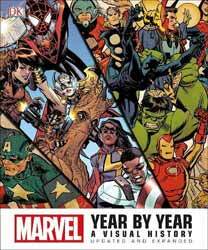 Aside from everyone’s favourite superheroes (including: Hulk, Iron Man, Spider-Man, Daredevil, Thor, Captain America, Prince Namor and countless others) and Super-Villains (such as Doctor Octopus, Doctor Doom, Loki, the Dread Dormammu, Kingpin and many more), this book explores the many other avenues Marvel has taken across the years, that count Westerns, Comedies, Cartoons, Teens (Millie the Model and Nellie the Nurse! ), True Crime, Romance, War Stories and Weird Tales amongst their numbers. Particularly over the last few decades, however, it is super-powered beings that capture our imagination… to the extent that Marvel has expanded regularly to the big screen and returning TV serials, such as Marvel’s Agents of S.H.I.E.L.D. With over seventy years of storylines to plunder it’s not difficult to reason why. In order to offer a fair and thorough view of a book I prefer to devour it from cover to cover. Unfortunately (or fortunately, if you look at it the right way), there is so much material here I doubt the review would be ready much before Christmas! That’s just as well, because this is a coffee table book (make sure you have a strong table) properly intended to be dipped into – or at least perused in small chunks, perhaps a year’s timeline at a time. Another massive plus for this tome is the very comprehensive index, so if you wish to follow the exploits of a particular character you can simply follow the page lists. Growing up, my favourite Marvel characters were Spider-Man and Daredevil, so my personal highpoint was discovering what happened to these heroes after I left them. Although I did briefly return to the former when Babylon 5 writer J. Michael Straczynski was writing for Amazing Spider-Man. In addition to the titles and plotlines, we are also given information on movements behind-the-scenes, the comings and goings of prominent writers and artists, including the heady early days of Stan Lee (did you know he was made Editor-in-Chief at only 18 years of age! ), Steve Ditko and Jack Kirby. So there is plenty to enjoy here, for long-time fans of comic books and those coming new to the back history through the big-budget feature films. I can’t recommend this release enough. The four pedigree contributors here have made this as comprehensive as it’s possible to be, whilst keeping the information brief and concise.